On Lap 43 of Sunday’s Auto Club 400, Brad Keselowski’s No. 2 Team Penske Ford brushed the outside wall and fell back in traffic. 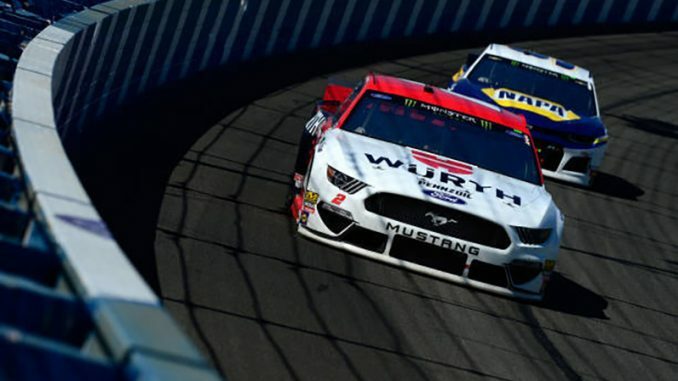 Keselowski was 22nd for a restart with one lap left in the first stage of the race, but he didn’t stay there. Though a combination of pit strategy and determined driving, Keselowski charged forward after dodging a wreck on Lap 60. On Lap 72, he passed teammate Joey Logano for second. And when eventual race winner Kyle Busch was slapped with a pit road speeding penalty under caution during the break after Stage 2, Keselowski led 38 straight laps and built a four-second lead before a timely caution on Lap 164 put Busch back in the mix for the win. Ultimately, Keselowski finished third behind Busch and Logano, but he wasn’t fully satisfied with the performance of his car. “We were a little off, really, all day,” Keselowski said. “We got a lot better from the first run to the end. We were so strong in practice. The track changing kind of threw us for a loop with the wind. Just never could get right off Turn 2. Ended up kind of costing us the race there with the 22 (Logano). I couldn’t stay in front.